This panel was undertaken using the traditional methods of wood graining; pigments ground in a stale beer binder. The trompe l'oeil work was carried out afterwards in artists oils. Walnut is a popular choice for the specialist decoration of joinery using faux wood graining paint effects. Walnut was typically used in England between 1660-1735 however in Continental Europe its use was extensive long prior to this. The beginnings of the use of Walnut coincided with the reaction to Puritanism, the spirit of the Restoration finding an enthusiastic market for the French Huguenot craftsmen and their Dutch influences encouraged by the stylistic changes originating at the Court of Charles II. Walnut veneer has been used extensively for panelled rooms and doors and was also popular in the Art Deco period. 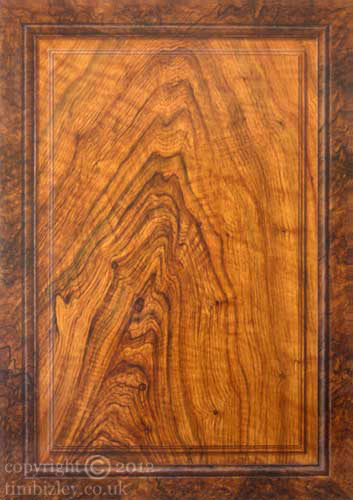 Walnut remains a popular wood for wood graining of joinery.